Lesson day! Carole came over and did a jumping lesson with us. I asked for some jumping exercises and input about our progress. After Wizard was warmed up, we trotted and then cantered over a series of five poles, set 9′ apart. At a trot, they were one trot stride apart. At a canter, they rode like a bounce. We did them on the left lead first. At the end of the poles, Carole instructed me to ask for a halt, sitting UP, not doing the typical slump and hunch with a pat. This kept Wizard’s hind end under him and was a good balancing exercise. He rushed through the first few times, but as I engaged my core and sat UP and really extended my arms, Wizard was able to use himself better. Interestingly, my dressage lessons and jumping lessons both echo each other with my position: hands up and out in front of me, not in my lap. On the right lead, Wizard was more balanced and rode through them quite nicely. We graduated to a little grid with a cross rail to a pole to another cross rail. I thought the pole between jumps would make Wizard scramble a little, but it actually helped him with his rhythm and he rode it nicely. Carole raised the second jump to a vertical, and once I was able to reach my hands forward and get a little stronger in my leg, she raised it a few more holes. 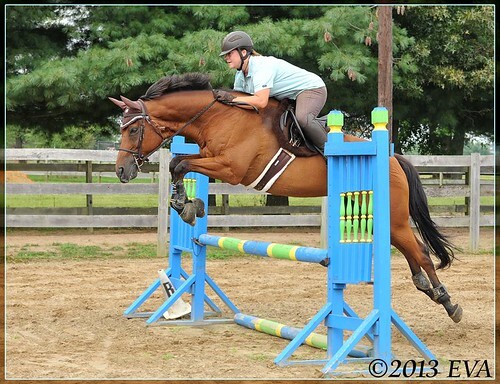 When we’re schooling without a trainer, I don’t jump more than two feet or so. With a professional watching, I felt comfortable working over slightly bigger fences. It felt great to graduate to some more substantial jumps. Wizard took them really nicely, and we got up to a 2’9″ vertical by the end of the lesson (picture above). As I tightened my core and stopped throwing the reins away over fences, Wizard responded with a rounder, more balanced jumping style. I have a lot of work ahead of me if I want to get my leg strong enough for bigger jumps. I see a lot of stirrupless work in my future. I also could feel my position go out the window as we rode through the gymnastic lines. Carole would give us something to work on, and I could hold it to the jumps, and then it was gone. By the end of the lesson, I was at least carrying the seat and hands to the first fence. Now I need to keep it all the way through the line. At the very end of the lesson, I could feel Wizard backing off from my leg just a little bit. He willingly took all the jumps, but it felt like he lost just a bit of his forward desire at the end. He actually added a stride for the very first time- he usually launches with a super-long distance. We ended with an inviting cross rail and then I cooled him out. For a regular rider, it was not a lot of jumping, but for me and Wizard, it was a fun challenge. Carole’s great at evaluating a horse’s comfort level and working just to the point of building confidence for the next lesson. Our homework is to canter poles, both in a series and as singles. I need to work on my hands and on my leg. 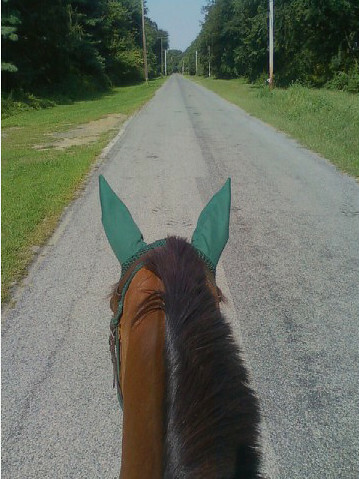 I plan to do some half-seat canter work on the trails. It was a great lesson, and it felt great to take that step to the next level. Kris and I went out on a fantastic 2-hour trail ride. The weather was perfect and the bugs weren’t too bad. We covered just under 6 miles, crossing a little stream, riding around some fields, and exploring a great wooded path that runs along the stream. Wizard let Sunny take the lead at the end of the ride. What a difference it is to ride him now from how he used to be. Gone is the horse who needs to be on the lead at all times and needs to be moving at a hurried walk. Now he can mosey along behind a trail buddy. It only took 4-5 years! I only had a short window of time before work, so I rode Wizard in the outdoor arena and tortured myself with a little stirrup-free trot work. Wizard was happy enough to truck along while I did my best to get my position under control. I avoided riding without stirrups for a long time because of my back, but now that I’ve cut back on photo work, my back (touch wood) is feeling better than it has in years, and I can handle the no-stirrup work again. Before work, Wizard and I took an hour-long trail ride. We cantered down the straight cantering lane and rode a big loop around the perimeter of the Horse Park cross country field. Wizard was a little looky with all the wind, but didn’t do anything wrong, even when we came across a few different dog people. Wizard got another dose of Pentosan. I also am trying a short ulcer treatment cycle to see if it helps with his goosey behavior during grooming sessions- it’s mostly on his right side. So far, it’s not doing anything. Could it be saddle fit? Or maybe something else. The good news is that he’s moving out better now that he got his Pentosan back. And he rolls over all the way when he rolls- usually, he rolls on one side and then gets up and back down again to roll on the other side. Only when he’s feeling nice and limber can he roll over all the way with regularity. We chased daylight and did a similar ride to Monday’s session. This time, we took a bigger loop so he could see the arenas and come back through the cross country field. I found myself humming a song to myself while we finished our loop- Wizard was very relaxed and happy and snorting along. Maybe he enjoys hearing his goofy rider sing songs by the Kaiser Chiefs. He probably also got a kick out of me YELLING at the deer to get out of our way. They just stand there until the very last second and then bolt, so I try to get them moving along sooner with some encouragement. And another sneaky one LEAPT right next to us out of the bushes with a loud snort, startling us both for a moment.